Stores the energy wasted by the elevator when motor brakes to return it in the next consumption trip. 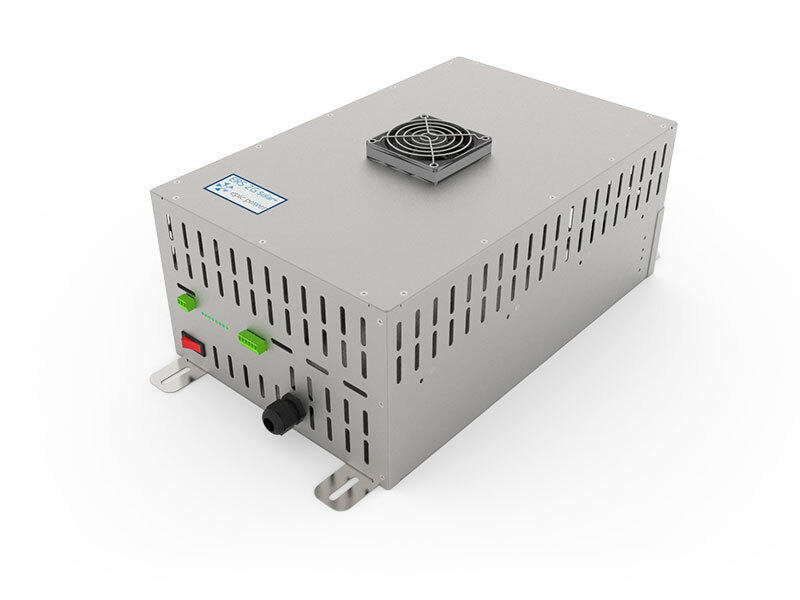 Energy savings up to 70% with no harmonic distortion and no added stand-by consumption with a simple two-wire connection to any drive. ERS 2G is a bidirectional high-efficiency DC/DC converter integrating energy storage module of ultracapacitors. A very simple connection of ERS 2G to any VVVF drive is enough to transform the elevator to a regenerative one with storage. Only the connection to DC link of the drive is enough for the system to automatically store the energy in the supercapacitors when generated and return it when there is a consumption. Supercapacitor modules offer better power density and cycling features than batteries. Therefore, they are the best possible solution for fast charging and discharging applications such as in elevators. 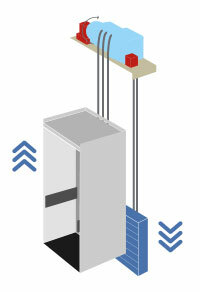 Simple integration both in new or existing elevators with no need for replacements. Recovers and stores the energy generated by the elevator to return it in the next consumption trip or to support the drive’s standby. No regeneration to the grid. No harmonic problems. Granting improvement of the efficiency classification of the lift. Elevator actually consumes less energy from mains. Very simple two-wire connection to any drive, new or existing. Measurable and accessible energy savings. 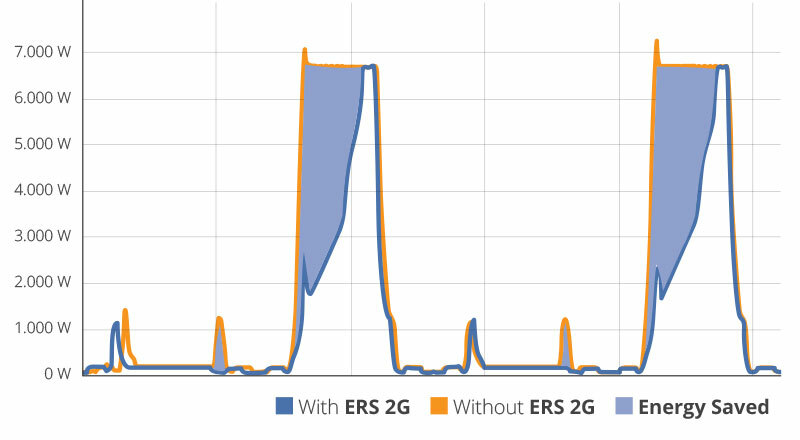 Data obtained in a real elevator before and after installing ERS 2G. In electric traction elevators that include VVVF drives, also known as inverters, the generated energy is wasted in the form of heat in a braking resistor. ERS 2G is capable of storing this energy to return it to the same elevator thus reducing the consumption in the next trip or, if there is no immediate trip, supplying the standby energy of the drive until the energy stored is depleted. The new ERS 2G also includes an option to connect solar panels. 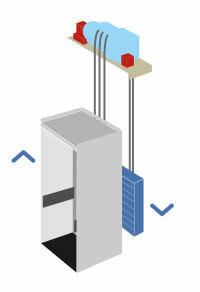 It revolutionizes how an elevator consumes energy because the elevator actually demands less energy from mains. This is not the case with regenerative drives, with which the elevator consumes the same and then returns to the grid. Saved energy is measurable and can be communicated via CAN bus under request. 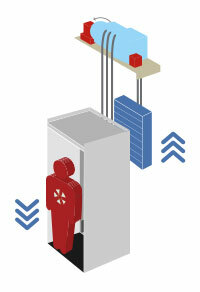 In a typical elevator, the cabin is counterweighted. When the counterweight goes down, the cabin goes up and vice versa. The same thing happens when the cabin goes up unloaded; in that case the counterweight is heavier, gravity moves it down and the motor generates energy again in the same way a dynamo does.